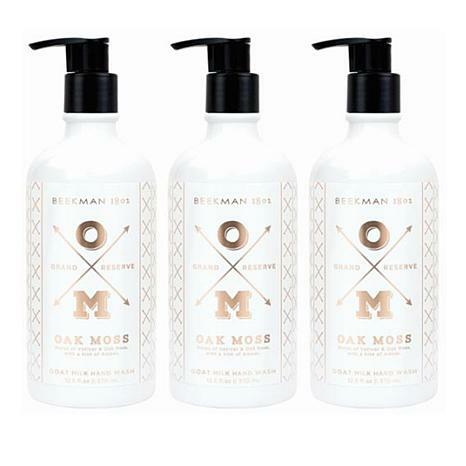 A trio of fragrant hand washes formulated with goat milk and other key ingredients to help moisturize and gently cleanse hands. Water (Aqua), Glycerin, Cocos Nucifera (Coconut) Oil, Elaeis Guineensis (Palm) Oil, Ethylhexyl Palmitate, Stearic Acid, Stearyl Alcohol, Dimethicone, Sodium Stearate, Steareth-21, Fragrance (Parfum), Mangifera Indica (Mango) Seed Butter, Caprae Lac (Goat Milk), Butyrospermum Parkii (Shea) Butter, Theobroma Cacao Seed (Cocoa) Butter, Aloe Barbadensis Leaf Extract, Camellia Sinensis (Green Tea) Leaf Extract, Vitis Vinifera (Grape) Seed Extract, Vaccinium Myrtillus (Bilberry) Fruit Extract, Silybum Marianum (Milk Thistle) Extract, Pinus Pinaster Bark/Bud (Maritime Pine) Extract, Ginkgo Biloba Extract, Argania Spinosa Kernel (Argan) Oil, Persea Gratissima (Avocado) Oil, Rosa Canina (Rose Hip) Seed Extract, Lavandula Angustifolia (Lavender) Oil, Rosmarinus Officinalis (Rosemary) Oil, Mentha Viridus (Spearmint) Oil, Tocopherol (Vitamin E), Ascorbyl Palmitate, Acrylates/C10-30 Alkyl Acrylate Crosspolymer, Phenoxyethanol, Ethylhexylglycerin, Xanthan Gum, Tetrasodium EDTA. These hand washes leave your hands feeling clean. Some other brands are full of perfumes, but you dont feel like your hands are really clean after washing. I have pets, garden, and am a caregiver. I want to wash my hands, and have them feel clean.I love the 3 packs. When I just got one wash in the caddy duo, I only used the wash twice before I realized it was almost gone. My teenage son liked it and was using it all the time!Suggestion: A multi pack with assorted scents!! Love this scent better than any other I've tried many, $250 worth to be exact, and love the orange blossom lip balm. The new Fig lip balm not crazy about. The soap bar grapefruit two year old and still not down to regular bath size. I love this goat milk hand soap. Keeps my hands soft and I hardly ever use hand lotion now. At least not as much as I did before buying this hand soap. The Beekman have superb products. We have been Beekman Neighbors for about 4 years now. We knew them from their TV show, and just wanted to "be supportive", so we bought a bar of soap, and now it's at every sink and in every shower, (and home care products too). Consistent... & just the best! My husband and I like how our hands smell and feel (soft), after using this hand soap.